I recently had a chance to request a 2017 Audi A4 2.0 TFSI quattro as a service loaner from Audi Wilsonville. 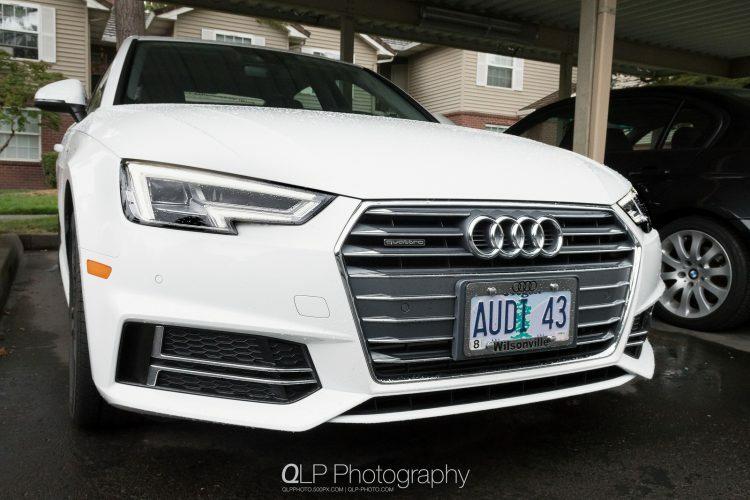 Although I had a chance to do a very quick test drive of the new A4 when I went to the recent movie event Audi had promoted, I needed a little bit more time behind the wheel to get a better feel for the car. 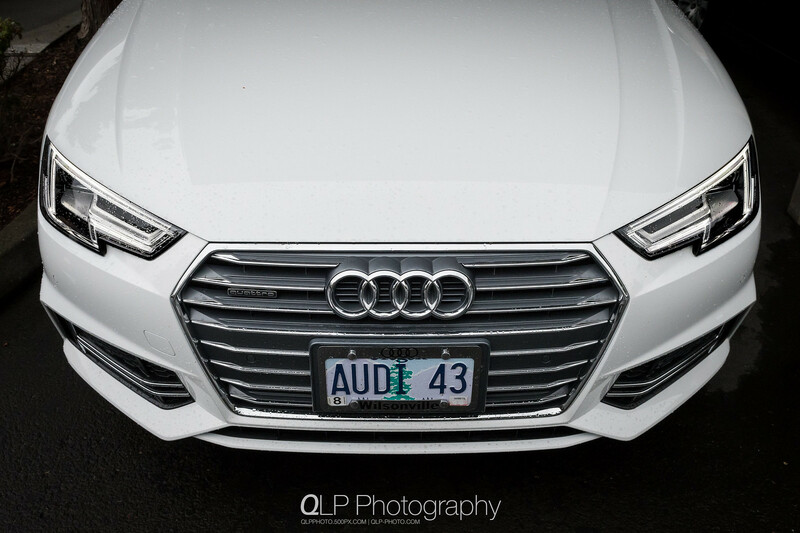 The Audi A4 was optioned out with the Premium Plus and Technology package and dressed in Ibis White. If you were to just quickly glance at the new A4 as it passes you by on the road, you might not be able to distinguish it from the previous generation A4. 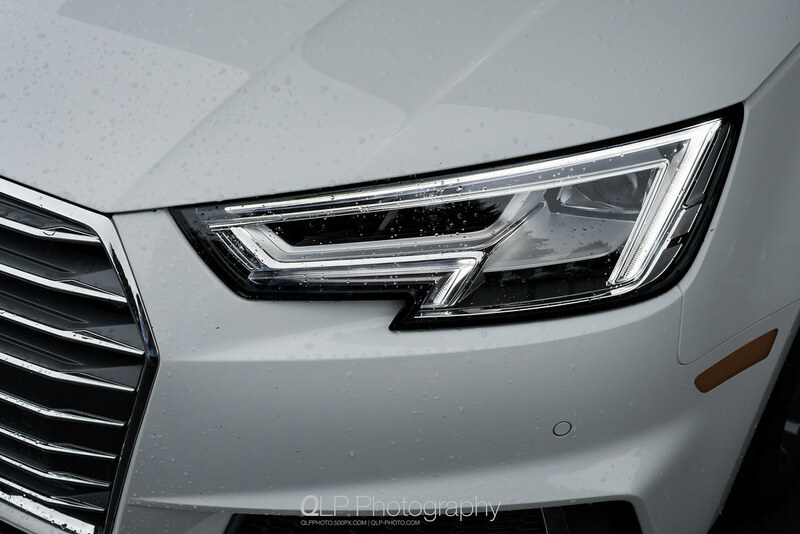 Now, if you were to get a good look at either the front end, as shown above, you’ll notice pieces of Audi’s new design language; including, the new single-frame grille is a little more squat and wider than before and the new multi-segment LED DRL headlight design. The rear end gets a bit of a nip-and-tuck and a more svelte taillight. Where you will really notice the biggest change with the new Audi A4 is the interior. Gone is the driver oriented center stack containing the MMI display, media slots, and the AC controls; and, in is a more minimalist layout. At the very top of, what could be called the center stack, is a fixed MMI display. If you have driven one or more of the current generation Audi A6, A7 or A8 models, you would have a retractable MMI display on the dash. According to Audi, most drivers would leave the display up and would rarely have it retracted. Even if you did retract the display, using some of the features that you wouldn’t expect be connected to MMI (such as adjusting or setting the memory seats) would cause the screen to pop back up momentarily. So, to the chagrin of some of the customers, Audi went with the fixed MMI display route in the new A4. During my relatively short time with the A4, having the screen fixed in position didn’t obstruct my view to the outside world. In the aforementioned A6, A7 and A8 models, with the screen up, it would obstruct some of the view out at times. But, hey… there’s a button you can press to turn off the display! Below the fixed MMI display and the AC vents is the cluster of controls for the AC system that is very similar to the one found in the latest Audi Q7. In the A4 that I had with three-zone climate control, there two are knobs that control the temperature with little LED displays showing the set temperature. Between the two knobs are touch-sensitive flip switches that control fan speed and the various AC modes. If you run your finger on top of or below the flip switches, the LED display will show what options are available and which direction to flick the switches. 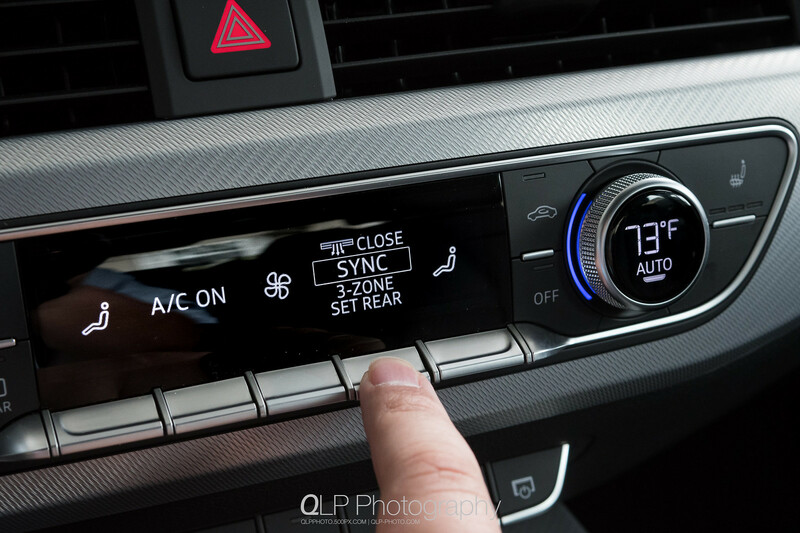 There are several other buttons surrounding the knobs that control the heated seats, defoggers and air recirculation. 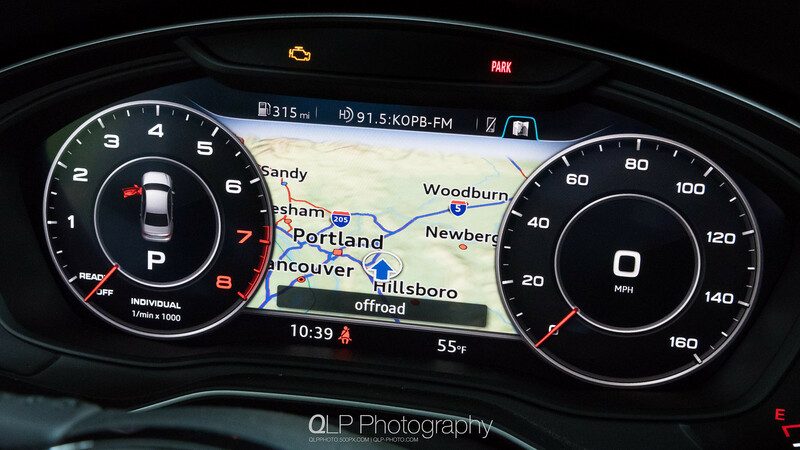 Even though I did get a head start on learning the controls when I tagged along for a quick Audi Q7 training session at Audi Wilsonville, there were two things that I wasn’t a fan of, having been used to how the controls work in my S5. First, pressing the temperature control knob in the S5 would confirm the setting; while, in the new A4 and the Q7, pressing the knob will trigger Auto mode. I lost count how many times I unintentionally triggered Auto mode in the A4 when all I thought I was doing was confirming the temperature setting. That being said, I know that I don’t have to press the knob in the S5 to confirm the temperature, as it will set it after a few seconds; but, I press it so that it clears the temperature pop-out that appears on the MMI screen immediately. The other thing that I didn’t like was the location of the Off button in the new A4. I really would prefer if the Off button were located on the driver’s side rather than the passenger side. I tend to use that a lot more than the front or rear defogger buttons and don’t mind if those buttons were on the other side. Below the AC control cluster is a row of buttons that provide options to change the Audi Drive Select mode, if so equipped, and buttons to turn on or off auto stop/start, park assist and the MMI display (as mentioned above). On the topic of auto stop/start, this is where another one of my pet peeves pops up. When Audi introduced auto start/stop in their model lineup, you had the button that you can turn off the feature until you would want to turn it back on, and it would remember that. Recently, turning off auto stop/start will only turn it off for that driving session. Turn off the car, leave and come back, it turns auto stop/start back on. I know this probably has to do with ways to allow Audi to eek out a percentage point or two more out of the fuel economy numbers when the feature is on-by-default. I also think other carmakers that have auto stop/start systems have had their systems always default back to on when the car is started up. It’s more of an annoyance than anything else when auto stop/start is a bit more random than just auto. That said, I found that while leaving the gearbox in Sport mode, it blocks auto stop/start from kicking in. I guess that’s a win-win. While on the topic of the gearbox, the new Audi A4 is currently only available with a 7-speed S tronic dual-clutch gearbox in either front or all-wheel drive configuration. This is a huge step up from the multitronic CVT that was fitted in FrontTrak models and, at least for me, a solid step up from the 8-speed tiptronic. I’ve always been a fan of the sportier, quick shifting nature of Audi’s S tronic gearbox, especially when mated to the supercharged 3.0-litre V6 found in the current S4 and S5. That said, leaving the S tronic in standard drive mode in the new Audi A4 seems to make the A4 a little too docile when it comes to acceleration and shifting; not to mention, it will want to climb through those gears as quickly as possible. In Sport mode, that changes how the A4 shifts gears and shifts its new body into something rather quite sporty. 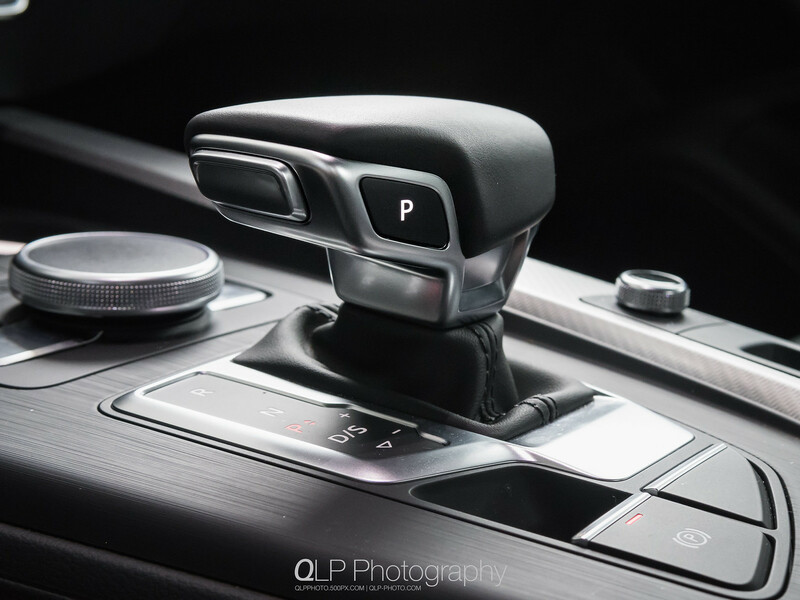 To control the S tronic gearbox, the A4 has received the new, fully electronic gear selector that is also found in the Q7 (and, a slightly different version found in the latest R8). 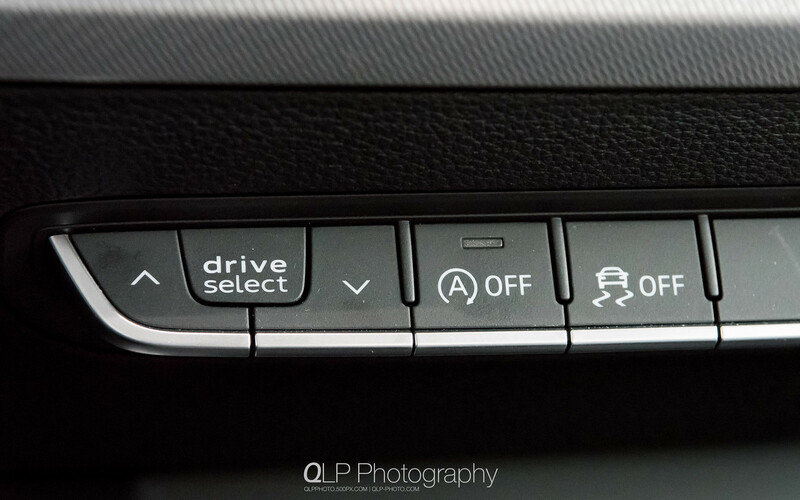 Park is now a button on the selector itself and you rock the selector back and forth between Reverse, Neutral, Drive/Sport or to the right into manual mode. I prefer it to the selector found in the Audi A8 (which is also used and, initially, without the auto-park selection software, in several FCA models that have been recalled) as it has a more traditional trigger button and park is right on the selector itself. Is it better than the traditional PRND/S gear selector? Time will tell. 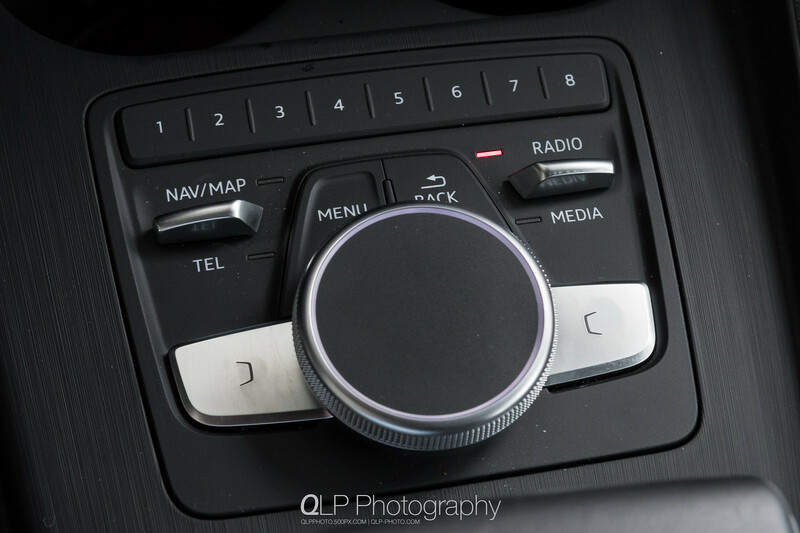 In front of the gear selector is the MMI controls, including the MMI touch enabled knob, control switches that were first found in the current Audi A3, and touch-sensitive preset buttons. Generally, I found the controls to be pretty easy to use, though the location and size of the Menu and Back buttons took a while to get used to. Now, if/when Audi brings over the manual transmission option for the A4, the gear stick moves up to where the MMI controls are here, with parking brake and radio presets to the left of the stick. 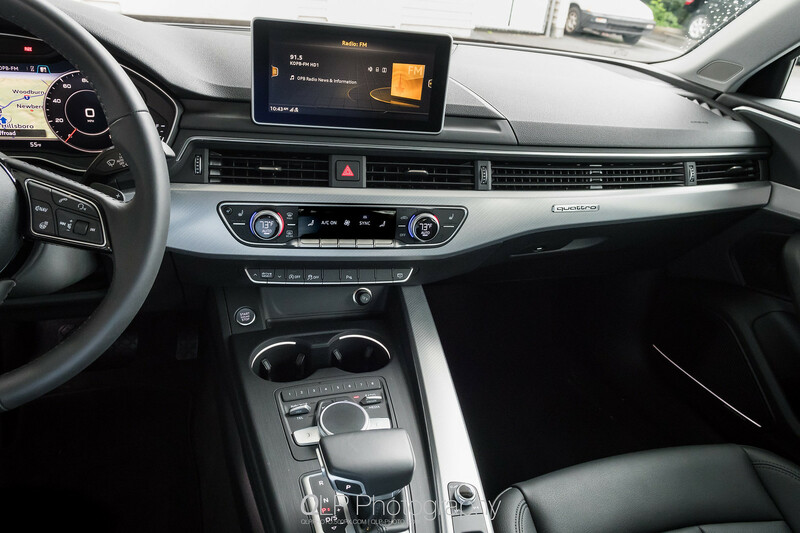 With that, the MMI controls move back to where they are situated now in the B8/B8.5 A4 and A5 models; but, the button layout is closer to what’s found in the current A3. Of course, if you opt for the Technology package, you can forgot some of the layout changes and make use of the steering wheel-mounted controls and use the Virtual Cockpit system to control some of your multimedia and navigation selections (but not all of them). Speaking of Virtual Cockpit, I fell in love with it when Audi first demonstrated it and incorporated it into the R8 and the TT. I had my first hit of Virtual Cockpit back when I sat in on a training session on the Q7. Between the switchable views, moderately customizable display pods and the more detailed navigation screen, it takes the instrumentation panel found in the A6 on up and makes it many times better. For those that want Virtual Cockpit, be prepared to either move up to Premium Plus and add the Technology package or spend the big bucks and go Prestige trim level. I’m not sure if it will be something that will be available in the upcoming S4 and S5 with Virtual Cockpit, but I would love the option of having a digital tachometer in the middle and everything else on the side. In the A4, I can live without it, as the large tachometer and speedometer view is still generously sized and does not appear to lag in anyway. Anyway, that’s a long enough novella regarding the interior and technology bits of the new A4. In addition to the switchover to the S Tronic gearbox, the A4 gets an updated turbocharged 2.0 TFSIengine, which had initially been used in the A6 2.0 TFSI, that makes 252 HP and 273 lb-ft of torque; which, is 32 HP more and 18 lb-ft more than the outgoing A4. The new A4 also rides on the new MLB Evo platform, which debuted with the new Q7, and, most importantly, brings on additional weight savings and improved suspension configurations. All of this makes the A4 feel more nimble and more responsive over the outgoing A4 in most aspects. The only aspect that it feels to be a general step back is the rather numb steering feel that has been creeping in more and more over the past few years. I drove the new A4 around town, on the highways and squeezing through downtown parking garages. The only time that the ride felt harsh was on the rather bumpy and rutted streets of downtown Portland, or over aggressive speed bumps (or speed mountains). The over-assisted, numb steering did help reduce the effort needed to slowly maneuver around tight parking garages and squeeze into parking spots. Overall, the A4 didn’t really feel sluggish driving around town or when needing to pass another vehicle on the highway at speed; but, there are still some hints of turbo lag when trying to get going off-the-line. Also, while trying to crawl up a steep parking garage ramp, the clutch was slipping a lot more than I would have liked. I haven’t had that problem with the previous A4 or other Audis equipped with traditional torque converter-equipped tiptronic gearboxes. Between the time I picked up the A4 and when I returned it, I averaged close to 22.5 MPG with a mix of about 60 percent highway driving and 40 percent city. I did not attempt to do any kind of hypermiling in the A4, considering that I had the gearbox in S mode almost the entire time; which, also defeated the auto stop/start system and kept the gearbox from going into 6th or 7th gear. At the end of the day, I am quite impressed with what the new Audi A4 brings to the table and, for the most part, is a good upgrade over the outgoing A4. Getting to drive the new A4 makes my decision to get the new A4-based allroad quattro when it arrives stateside all that much easier. I would like to thank Audi Wilsonville for providing me with the 2017 Audi A4 service loaner. Additional photos of the 2017 Audi A4 can be found in my “23 Jun 2016 Ibis White 2017 Audi A4” photo album on Flickr.